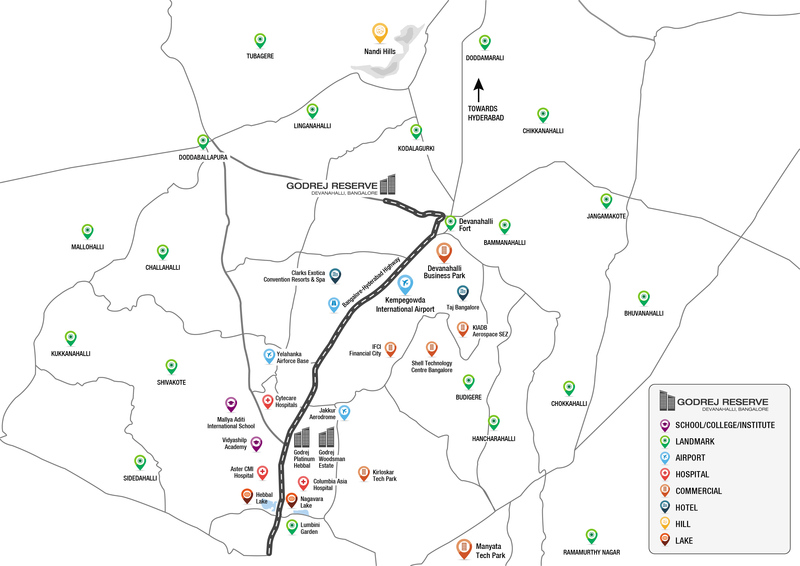 Devanahalli is one of the rapidly developing locales in the north-east zone of Bangalore. Its well-planned infrastructure and proximity to International Airport have acted as the catalysing agents for the growth of this area. Moreover, it lies close to the rapidly booming BIAL IT investment region which for sure is a top attraction. Devanahalli is transforming into a prime commercial hub with development of Industrial and IT parks which is expected to create more than 300,000 employment opportunities. The area is strategically situated at short drive distances to key locations like Yelahanka (25 Kms), Hebbal (33 Kms), Manyata Tech Park (35 Kms), Shell Technology Centre (25.2 Kms), RMZ Galleria (31 Kms), Nandi Hills (24 Kms) and Devanahalli DC Office (5 Kms). Devanahalli is brimming with property &infrastructure development activities majorly owing to the establishment of Bangalore’s International Airport. Ever since the outset of International Airport, Devanahalli has been experiencing the positive outset in terms of social and physical infrastructure. The upcoming Shell Technology Centre, Science Park, Business Park, Aerospace Park and SEZ along with BIAL IT investment region are few of the major infrastructure developments prospected to change the real estate scenario of this region making affirmative impact among the investors. Devanahalli is a home to second-largest airport in the country. The region is quickly emerging as one of the main IT hubs of Bangalore. Leading IT parks like the Hardware Tech Park, Aero SEZ and International Tech Park are causing a huge impact on the real estate sector. The proposed Information Technology Investment Region (ITIR) has also created a big buzz. Additionally, a Science Park and Financial City are expected to come up in the area soon. With all these upcoming developments, Devanahalli is witnessing huge demand for residential properties which is bound to increase further in the future. The six-lane Bellary Road or NH7 connects Devanahalli to the main parts of the city. This allows commuters to traverse placidly to areas like Yelahanka and Hebbal in around 20 - 30 minutes. Devanahalli will also be part of the Phase 2 of Bangalore’s Namma Metro project. This will tot-up the connectivity and development of the area. Disclaimer: Any content mentioned in this website is for information purpose only and Prices are subject to change without notice. This website is just for the purpose of information only and not to be considered as an official website. This website belongs to official Channel partner of Godrej Properties.